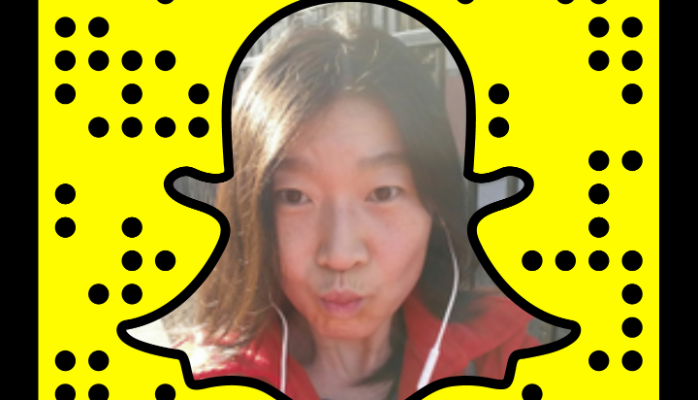 5 Ways to Use Snapchat as A Teaching and Learning Tool in Higher Education — Ai Addyson-Zhang, Ph.D. Please note: "This article is originally published on Brian Fanzo's website as a guest blog post. Most people probably agree that the most impactful change to the public relations, marketing, and/or advertising industry within the last decade is the evolution of digital landscape. Personally, I don’t even remember the last time when I actually used my phone to call someone for a business- or work-related matter (okay, it was last night, but you get my point). Social media platforms are making communication faster, easier, and more dynamic and engaging. Emojis and GIFs are adding another level of engagement to communication messages. In my seven years as a professor of Public Relations, I have seen social media quickly rise and predominate the field as the de facto method of spreading an organization’s message, engaging with the public, and maintaining an edge in highly competitive environments. And when we think about engagement, social media outlets are offering more dynamic ways to reach out to customers, consumers, influencers, etc. In this article, I’ll share how I have been using Snapchat, in specific, as a teaching tool to increase engagement with students in my classes, and help prepare students to engage with the industry. Before I dive into the topic, please let me tell you who I am. 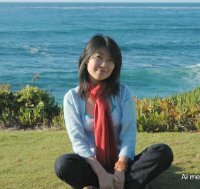 My name is Ai (pronounced as “I”) Zhang. I obtained an M.A. and a Ph.D. in the field of Communication from Syracuse University and the University of Maryland, respectively. I have been teaching public relations at my current school, Stockton University, since 2009. When I started teaching, I had little understanding of how the industry used social media. And topics related to social media were nowhere to be found in our curricula. Until one day in the spring semester of 2014, I read in a student’s paper that he had no idea what Pinterest was. That was my wake-up call and brought me to my social media journey as a public relations professor. I realized that if I wanted my students to stand out in today’s competitive market, they need to be proficient in using these digital platforms. Here I am today, being addicted to social media. So, how do I use Snapchat as a teaching and educational tool? Let’s get started. This isn’t necessarily something I consciously do, but rather is an innate side-effect of using social media. With that said, it’s probably one of the most important parts of being on social media. Students tend to be afraid of teachers, a LOT. Even though you might think you are the friendliest person on earth, there is a power distance that separates teachers from students. Approaching teachers, even when asking legitimate class-related questions, can make students feel intimidated and stressed. Using Snapchat along with Twitter and Facebook to share my personal and professional life has helped me communicate to the students that I am a real person like them. I laugh, sleep, work, grade papers, teach, shop, complain (sometimes), and procrastinate (never! ;). But the point is, sharing some parts of myself in my “natural environment” helps build a rapport with students that wouldn’t otherwise exist. And this is extremely helpful for facilitating their learning and engagement in the classroom. There are multiple ways that you can use Snapchat to engage students. Doing a Snapchat Q&A is one of my favorites. For example, when you receive a question from a student via email, rather than emailing back, respond to that question via Snapchat. I can almost guarantee that receiving a personalized response from a professor will blow a student away. It instantaneously connects you, the “superior,” and the student. Plus, who doesn’t love taking a break from answering and responding to emails? The Snapchat Q&A approach works particularly well with those students with whom you already have a better connection. Sometimes, a simple question and answer can lead to an insightful discussion about a class topic or career related issues. I love it when these extended discussions happen. You can feel by the end of a Snapchat Q&A that you are closer to the student and the student feels more comfortable at talking to you. The “face-to-face” and one-on-one communication via Snapchat allows you to transmit what would be lost by using emails. Another fun way to involve students is to ask them to create class-specific Geofilters. My students love this exercise, and sometimes I offer them extra credit to do so. In this way, they earn course credit and learn an important tactical skill that benefit their careers — win-win. 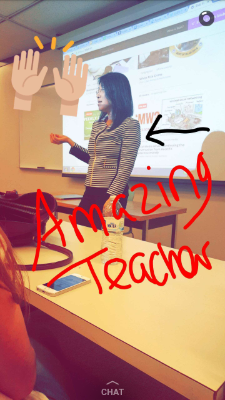 Here is one example of a Geofilter created by one of my students using our class hashtags, #AZSM. In today’s information- and noise-loaded environment, differentiation is crucial to help an individual or a brand stand out. I use Snapchat to give my students shout outs and highlight their accomplishments. 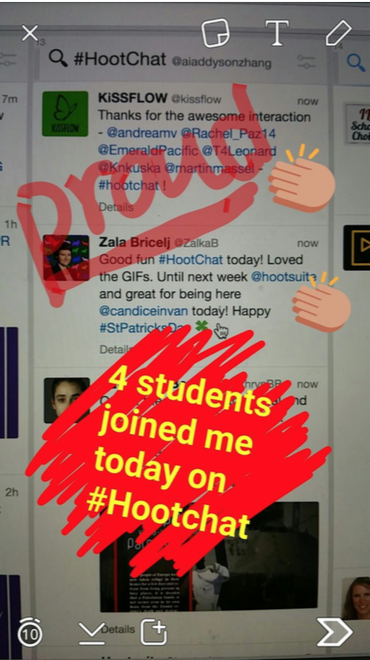 For example,a few weeks ago, I had four students join me on a #HootChat. I was so excited that they took charge of their learning and then created this Snapchat story → Several individuals and even Hootsuite itself chatted back about the contributions these students made to the discussion, and then I shared the feedback with the students. Cool, right? But you might be thinking, that’s good, but shouldn’t students be doing this self-branding anyway? Why are we praising students for doing what they are supposed to do? Well, the most important reason is that many students do NOT know how to use social media channels strategically to brand themselves, especially on a new platform like Snapchat. By observing how their instructors use social media, students learn to imitate our behaviors. Interestingly and unexpectedly, students started to brand me and give me shout outs. “Amazing Teacher”? Thanks guys! *brushes back tears*. With the spring semester approaching an end and graduation just around the corner, I plan to feature a few students as my snapchat “heroes” to showcase their accomplishments. I plan even let these “heroes” take over my snapchat account for a day. As many of my snapchat connections are professionals in the industry, this type of branding can further enhance these students’ professional reputation. Aside from posting students’ work and accomplishments, I also snap major events in our classes. For example, when we have guest speakers, I snap the highlights of their talks as well as their social media handles. Students have benefited tremendously from such virtual connections. I also share fun activities that our class does, such as our end-of-semester pizza party. Yeah! Cannot wait. 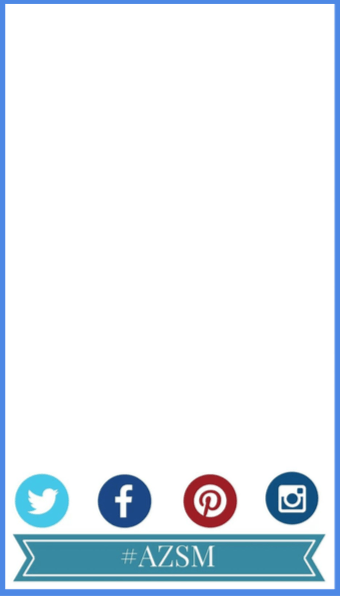 One of the attractive features of Snapchat is that its content disappears after 24 hours. In other words, it provides a sense of anonymity and privacy. I’m taking advantage of this by using the platform to coach and mentor students, especially on topics that they might feel otherwise uncomfortable to disclose. Again, think about the humanizing aspect — you might have students who are reluctant to come to your office hours to discuss academic or personal issues they’re facing (Confession: I rarely have students come to talk to me during my office hours unless I reach out to them first to schedule a meeting.) While I hope that students understand they can approach me in person, and I don’t want them to feel like they need to hide behind the perceived “safety” of an app, I also realize that I need to meet students where they are at. And that place often happens to be through their smartphone screens and Snapchat nowadays. 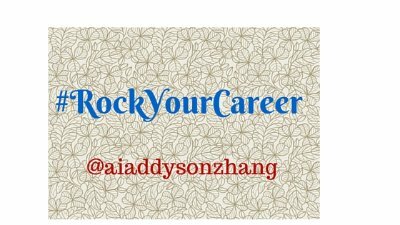 In light of this, I have recently created a #RockYourCareer hashtag to offer coaching and mentoring to students on both Snapchat and Twitter. In the traditional school environment, student-teacher interaction often ends as school closes. In today’s digitized environment, that connection can continue to be present even after students and teachers become spatially separated. Doing this type of coaching has brought me a strong sense of inner fulfillment. Brian Fanzo’s recently published an article, “Snapchat: What, Where & Why I’m All-in,” (check it out!). Among the many good reasons he lists to be in love with Snapchat — all of which I agree with, by the way — the one that resonated most with me is Snapchat’s ability to foster and nurture relationships and communities. Brands are getting their “authentic” selves out there, people are connecting — it’s all just one big happy interconnected awesome-fest. And from where I stand in the high, cold tower of the ivory fortress, this is an important aspect. The biggest problem I see in public relations education, is the disconnect between the academy and the industry. There are multiple reasons for this disconnect, and one of them is definitely that students are not integrating with the professional community until it’s time to go out and hunt for jobs. If you’re waiting until you’re on the job market to get connected, you’re starting too late! Or at the very least, students are missing huge opportunities to connect and integrate with organizations and professionals earlier in college. As an educator, I believe that part of my job is to reduce that gap by introducing students to the industry and to engage with industry leaders and influencers. I do this through “traditional” assignments, such as having students run PR campaigns for real organizations; but I also heavily incorporate digital tools like Snapchat to get students engaging with professionals in the field. Not only can you see what others are doing, but you can also get one-on-one engagement with people you might not otherwise have had a chance to meet. Hope you enjoyed reading these five tips. If you want to learn more about using Snapchat as a learning tool, please make sure to follow Dr. Karen Freberg@kfreberg on both Twitter and Snapchat. She is an innovator! And if you happen to be in higher education as well, I would love to learn how you use social media platforms to interact with your students!